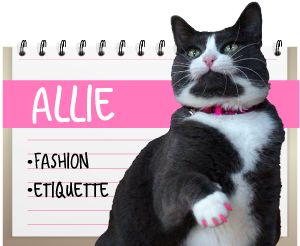 A Tonk's Tail... err, Tale...: Pet Fire Safety - and a GIFT! With much of the U.S. heartland in a severe drought, the danger of fire is on the increase. In fact, it's become almost commonplace lately to see fire advisories posted for our area by the National Weather Service. National Pet Fire Safety Day is sponsored annually by the National Volunteer Fire Council, ADT Security and the American Kennel Club (AKC). Since we were participating in the Blog the Change event yesterday, we missed Fire Safety Day. So we're naming today Belated Fire Safety Day! We care deeply about fire safety. We have seen, up close and personal, what it's like to lose everything you own - and to lose a beloved pet. If you've been following this blog for a bit, you know we're referring to the fire that destroyed the homes of bloggers Sebastian and CJ. 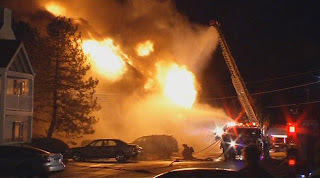 That same fire took the life of CJ's older brother Cosmo. Ever since that tragic event, I have wanted to design a pet alert sign that you can print off and post in the windows of your home. Unlike other pet alert signs, this one would allow you to customize it, so you can let firefighters know exactly who needs rescuing inside. You'll find these signs below, at the end of today's post. It's our gift to you. New data from the National Fire Protection Association indicates that almost 1,000 fires each year are accidentally started by pets. This surprised us! At least until we read the story posted by the AKC about a curious dog named Lucy. It never once occurred to us to remove stove knobs to prevent such a thing from happening. Thanks, AKC, for sharing that info! Water as a fire hazard? Yep, you read that right! We were shocked to learn that you can actually cause a fire by placing a bowl of water out on your deck. Seriously. If your pet spends any amount of time outdoors - or if you're just trying to be kind to neighborhood pets and wildlife - you probably have a water bowl placed conveniently nearby. Believe it or not, that can actually pose a fire hazard. There's a potentially dangerous combination that the National Volunteer Fire Council urges you to avoid, and that's water in a glass bowl. 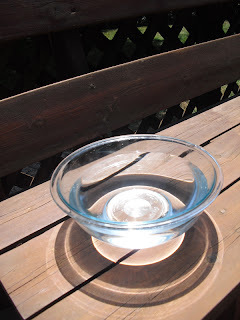 A glass bowl filled with water can have a magnifying effect when placed on a wooden deck. Both water and glass can filter the sun's rays in such a way that they can ignite the wood beneath. So please choose a ceramic or stainless steel bowl instead (and please... for your pet's sake, place it in the shade!). 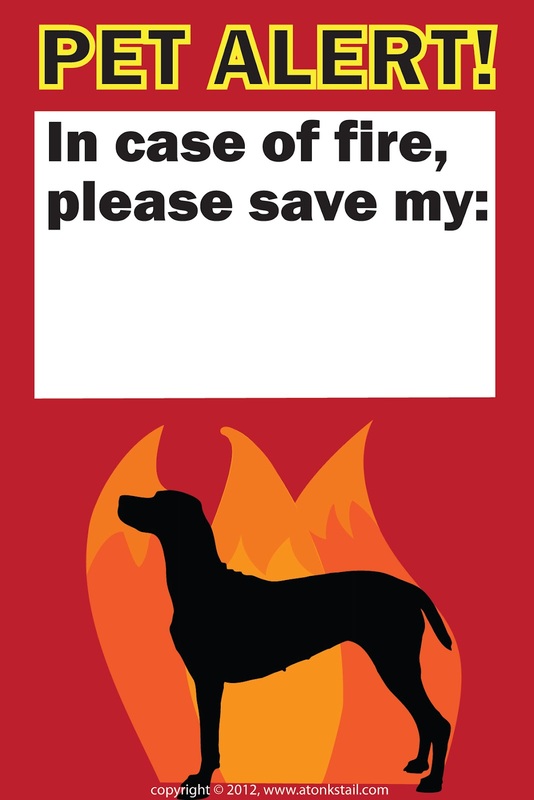 You can read more about fire safety awareness at the CATalyst Council, at 1-800 Pet Meds and at AKC.org. 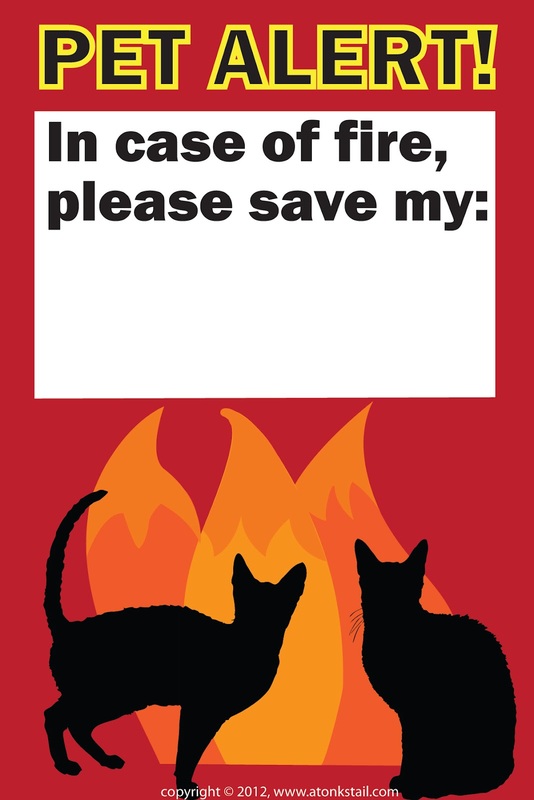 We've mentioned this before but we're taking this opportunity to mention it again: be sure to have a pet emergency kit stored near your main exit, and think through how you will respond should an emergency such as a fire occur in your home. For the longest time, we've wanted to make window signs that leave space for you to tell firefighters exactly what pet or pets you might have inside. So we created these printable alert signs with enough white space for you to write in exactly what kind of pet - and how many! - your firefighters need to rescue. All you need to do to download these signs is to right click and select "Save image as." This will download a JPG file to your computer that you can then print and hang prominently in a window or two. Taking them to a print shop and having them laminated might be even better! If you'd like a higher resolution file, please email us by clicking on the Contact Us tab at the top of our blog. We'll be happy to send you a higher resolution PDF file - just specify which one, dog or cat (or both!). The ASPCA also offers free generic Pet Alert decals that will adhere to any surface. Visit their web site to order their free Pet Safety Pack. Please stay safe during these hot summer months! Wow, we had no idea that a bowl of water could start a fire!!! Great post friends, thank you for the pet alert signs, very thoughtful of you. My have never thought of that a glasbowl actually can start a fire ! Your signs are really GREAT ! Great information! Thanks for sharing!!! These fires make us realise how lucky we are across the pond. Although we have had no summer just grey skies and endless rain at least we are safe, We feel for all those who have suffered and all those who worry. Brilliant idea the poster is. Have a great Monday. Thanks Molly! We miss visiting your blog these past few days - we gonna make Mommy spend some blog time with us tomorrow to catch up with everyone! Thank you so much! You did a fantastic job on the sign. 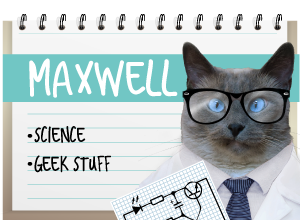 Maxwell: *baps Faraday* DUDE! That's Momma's work, not yours! What a great post! e has signs on our door with our names on them but me likes these ones better, they is so much more colorful! FaRADaY: HI NELLIE!!! WE MISS YOU!! We gonna Inform Mommy she needs to get over to your blog TOMORROW and catch up on all the news!! This is great advice! And it's nice to have an alternative to those decals - from my human's experience, they do not "adhere" very well to the windows. This is a wonderful post! THANK YOU for this great information. We never knew a glass bowl full of water could cause a fire (makes sense, but who knew?). We like those pet alert signs very much, adn appreciate that you acre so much about all of us, your friends. I did know about turning the stove on, especially dangerous if kitty is on the stove while you are away! But who would think a bowl of water could do harm! Thanks for the warning sign. The signs are pawsome! We need a kitty one. Great job guys on the sign and the post. Pumpkin, we'll get mommy to send tomorrow. She'll DM you if she can't find your e-addy! HI COSMO!! *waves paws wildly* How are you??? We gonna come over & visit tomorrow & catch up! I would love one of these signs. Our email is mrpippip(at)gmail(com). We had a very similar experience with the stove. Rosie jumped up and turned the burner on. She singed her whiskers, but fortunately no fire! WOW!!!! This was INCREDIBLE! Shared it everywhere!!!!!!!! I am definitely going to print those signs. THANK YOU!! Maxwell: *scuffs paw shyly* aw shucks...thanks! Dash! Canz U get Whskr to DM us the email addy? We'll send tomorrow! Thank you for spreading the word about pets and fires! The signs are pawsome! 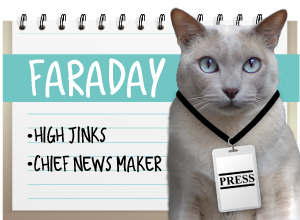 This is a life-saving GOLDMINE of information, Kitties. Thanks a MILLION!!! Seriously - wow. This is a great post, so many things we wouldn't have thought of. Thank you for posting the signs as well, we've been trying to find some here with little success! What a FABULOUS post! It's not fun to think about these things, but you're reminding us how important it is. And we HAD NO IDEA about the glass bowl! Wow...that's an eye-opener. Thank you for the decal designs! We just recently installed a security and fire alarm system and have put new security stickers in our windows. This will be a perfect addition.